There are days when the parent I want to be—the one who wakes with a smile long before her children stir, who never raises her voice and is constantly coming up with craft projects, poems to memorize, and perfectly prepared meals on the table—is so far removed from the parent I am (as in the harried, impatient, barking disaster that seems to be controlling me lately). Maybe it is the strict schedule of school, with the practices, homework, and early bedtimes that is catching up with me. Maybe it is the inability of Up North weather to make up its mind—is it fall? Is it late summer? Oh, wait, never mind, it is snowing. Right. Or maybe it is the fact that I have made the turn from a “late 20-something” to 30. I can honestly say that this move into decade number three (that sounds so much younger than 30, don’t you think?) is in many ways a giant sigh of relief. After all, I have three—yes three—children. It is a bit embarrassing, when most of your friends are, um, halfway to 80, and you have not even hit the milestone of moving away from the “me-centered” phase of life that is your 20s. There is also something a bit panicky for me in this latest birthday. I mean, I’ve been mothering for almost a decade now. When I was in college with a wee one, it was okay to fly off the handle now and then, to make big mistakes (like never setting a bedtime so that I’d have someone to bounce Tibetan Buddhist Psychology term papers off of at 1 a.m.), because, hey—I was just a kid myself. Now though, now that I’ve been living in northern Michigan for almost eight years, I am feeling more pressure to perform the right plays as a parent. I want to embody that image my city friends have of me: the granola mom who makes wholesome meals three times a day (unfortunately, Cliff Bars and bananas for breakfast do not count). The mom who practically lives outdoors with her children (not the one who, just yesterday, whined it was too cold for a game of Swiss Family Robinson in the backyard), or even the mom who has that laid back, Up North air about her. This last one is the worst for me. I live at a frenetic pace. I do and do and do, go and go and go. If there is a need, a volunteer position, a friend that is requiring assistance, I always want to be the one who steps in and makes the save. It inevitably leaves me zonked and exhausted, with to-do lists a mile long. And that, of course, leads to me going into freeze-mode, where nothing gets done. When nothing gets done, I get crabby. What a cycle. I’m not, however, a hopeless case. I chose to live where we do for a reason. The qualities of life here—the appreciation for the natural world; the strong sense of community; the commitment to raising children in play and place-based fashions—these things are the fabric of my dreams. The trick, of course, is getting to the place where we live what we love. For me, that means starting small. I am committing to say ‘no’ a little more, so that my planner can fill up with other things—freezing more applesauce, making pinecone birdfeeders. I will go to bed a little earlier each night, so that I can rise before my babies and have a cup of Light of Day Sunday Morning tea. On mornings when my patience is thin I am going to make myself stop and stand on my front porch to watch the sun come up, or pause on the back deck to see how the fog in the fields lifts like a curtain as darkness recedes. 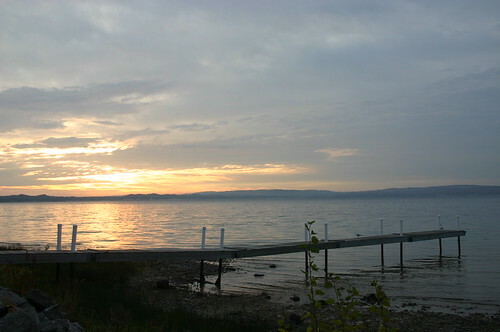 Last week, I packed up my two littlest ones and drove five minutes to the shore of Little Traverse Bay. Parking the car, I turned to Max and said “Just give me one minute.” I stood outside and took deep breaths of fall morning air. 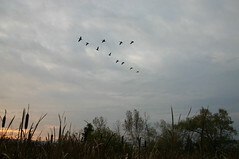 A flock of geese were honking as they took off from the cattails of a small inlet. The sun was midway between hills and sky, reflecting over the still waters and empty docks. It was 60 seconds of biting autumn air, but when I returned to the car, I was recharged in a way that felt like I’d been gone for days. These are the moments I intend to hold onto as I enter my thirties. I will recognize the need we have as mothers to take a time out, to step back and let the landscape lull us into a better place, a better mode of parenting. What about you? In what ways do you let living—or visiting—places up north recharge your parenting souls? i checked in by happenstance, what a nice way to end a long, very tiring day. Your writing always brings a smile to my face. great photos in addition to some wonderful writing. It’s good you took some time (albeit a few minutes) to enjoy where you live and refresh) remember to try and enjoy the journey, you live in a gorgeous place and need to take it all in. saying “no” every once in a while is okay, you sound pretty involved already. thank you for the post. I remember those days and that age with three little ones. Remember, every time you say ‘yes’ to one thing, you are saying ‘no’ to something else. Thirty is a liberating age. It’s not about being selfish. It really about being generous with your resources (yourself) where you will have the fewest regrets. I know you’ve heard it a million times, but they really do grow up fast. Good for you for recognizing early in their lives what’s important. Sounds like you need to get somebody to watch the kids and take a day to do a wine-tasting tour in Leelanau County. Just a suggestion. Thanks for sharing your thoughts–always a pleasure to reflect on your topics. Oh, Kate. As usual, I more than relate; I find myself double-taking to make sure I didn’t write this! The barking disaster, the sigh of relief at turning 30, the do and do and do, go and go and go, the commitment to raising children in play and place-based fashions – you remind me of me, the real one and also the one I wish I were. That bay just 5 minutes from your house must make such a difference. 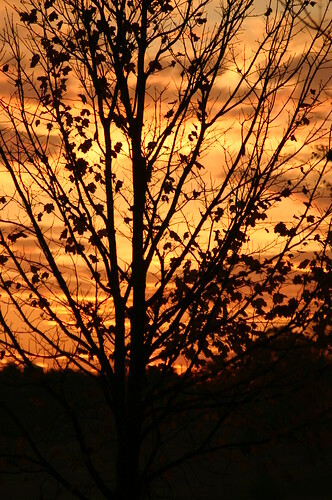 I’ll hang out there some sunset with you if you’ll let me. Kate…you got it, babe. Wish it didn’t take so much mindfulness, but so many things pulling so many directions. It is all worth it when you listen to your heart…the return is so satisfying.